If you don’t fish, boat or even scallop more than ten or so days a year at Steinhatchee, on our Natural North Florida Gulf Coast, it might pay you to consider renting a boat rather than owning one. First, there’s the cost of owning and maintaining a boat–and likely a trailer. It’s common knowledge that a boat is “a hole in the water into which you pour money”. And trailers need lots of maintenance, as well as licensing and then you have to pay launching fees at many ramps, public and private. An there’s also the advantage of coming in from a day of fishing, snorkeling for scallops (or just plain sightseeing) and turning over the “reins” to a dock hand, who relieves you of the responsibility of cleaning the boat and putting it up. Of course, there are costs, but even with gas prices at all-time lows, it’s easy to figure that renting a boat a few times a year is a bargain. Just be sure to call ahead for boat rental reservations. That way, the boat will be ready and waiting when you arrive for your adventure! 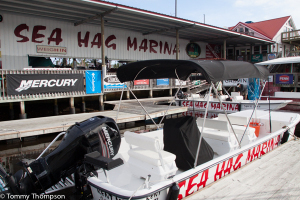 The Sea Hag Marina has a rental fleet of 24-foot Carolina Skiffs. Rent a deck boat from River Haven Marina for $200 a day, plus gas and tax. Good Times Marina: Good Times Marina (352-498-8088) can arrange a rental for you. 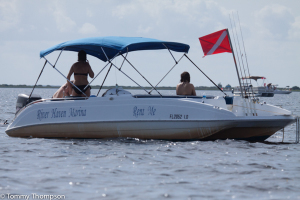 Or you can call Mike and Susan Williams directly at 850-371-1998 to rent one of their pontoon boats (21-24′). During scallop season they normally keep two boats docked at Good Times, but will also arrange delivery to the Steinhatchee Landing Resort. Prices range from $250-275 per day, plus gas and tax.